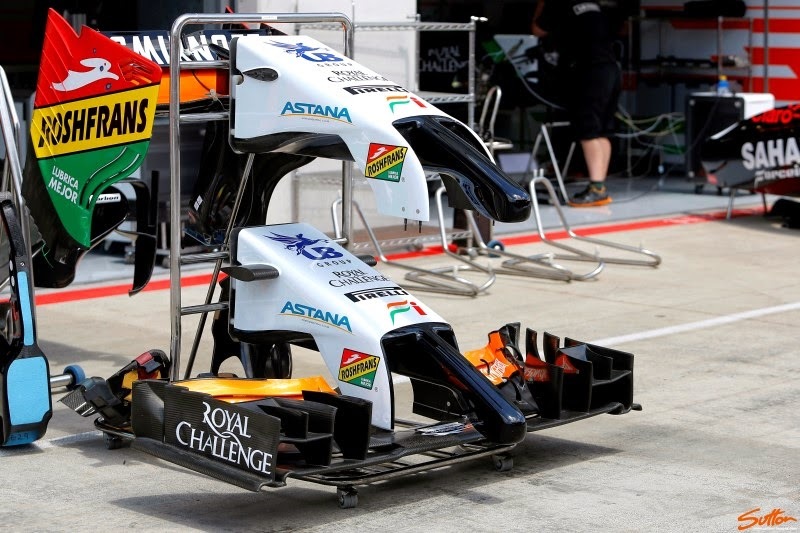 Force India have utilised a 'finger' extension nose since the start of the season and as part of their extensive upgrade package for Austria they've made some alterations to it (upper nose). The most widesweeping change comes with the movement of the mounting pylons into a more forward position where it mounts to the front wing increasing their involvement in the conditioning of airflow and marginally increasing the front wings rigidity under load. This inevitably leads to an overall lengthening of the nosecone section, giving more surface area with which to condition the airflow underneath the nose, which should not only benefit components downstream but give an upshot of performance. The upper surfaces inclination from the nose tip to the most rearward section is also reduced, giving a less abrupt curve with which the airflow must face going over the nose.